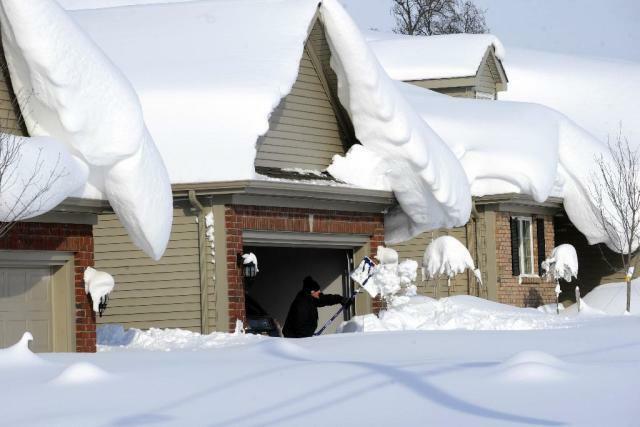 How Much Snow is Too Much Snow on Your Roof in Rochester, NY? The main reason Rooftop Snow Removal is important is that it’s crucial for preventing ice dams from forming on your roof. Another reason rooftop snow removal is so important is that it’s a good idea to keep all that excess weight off your roof. As a rule of thumb, one square-foot of snow that’s one-inch in depth weighs about a pound. If your roof has 12 inches of snow on it, that could easily amount to thousands of pounds of stress on your roof. That’s not even counting the weight of any ice dams that may form as a result of leaving the snow on your roof; just one cubic foot of ice weighs 57 pounds, and a typical ice dam can weigh thousands of pounds. Minimizing the stress placed on your roof is a great way to minimize the risk of leaking and cave-ins (the latter of which occur more frequently than you might think). The critical factor in determining excessive snow loads on your roof isn’t the depth of the snow, it’s the weight. “Theoretically, if your roof is built to code, it’s built to support more than the normal load of snow and ice. Instead, call a professional Rooftop Snow Removal Expert to safely do the job. Check to make sure they are insured — that immediately sets them apart from inexperienced competitors. For Rooftop Snow Removal Expect to pay $250 to $500 for most jobs. That’s because they need special gear, including sturdy extension ladders, properly anchored safety harnesses, and specialized snow and ice-removal tools.